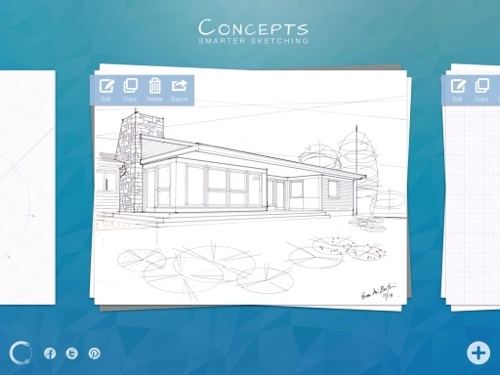 At its most basic, Concepts is a great freehand sketching tool, containing many of the features found in other art drawing apps. You can delineate with a finger or stylus, make different kinds of strokes and choose from several widths/weight and opacity, select a great variety of colors, and undo and redo. One feature it lacks is a bucket fill, and, most glaringly, there is no palm rejection option. The free features include multiple implements (pens, brushes, pencil, marker), paper types, isometric grids, COPIC color library, one Precision Shape Guide (arc), pressure sensitive styli, and an infinite canvas with zoom and rotation. The canvas (landscape only) is handsome; it’s clean and has a no-nonsense toolbar on the left side, which can be hidden. There is no indication that it can be moved to the right. The top icon on the toolbar is for saving and exiting the drawings. Below that is a squiggly-lined icon, which exhibits a panel with three pens (including a super-cool dotted pen), a marker, pencil, and airbrush. Text is available as an in-app purchase, and it’s paired with an import function for $1.99. The size and opacity of the markers can be adjusted in this panel. The color palette is strong; there are 356 hues to choose from. 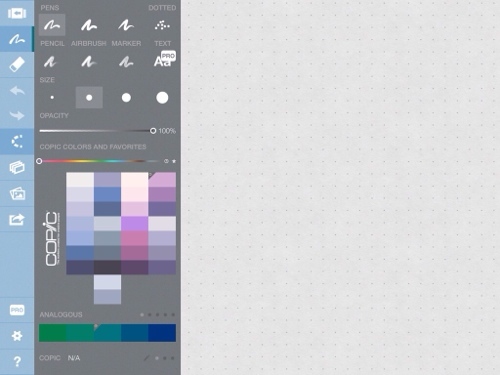 It’s the best collection of colors I’ve come across in a sketching app. 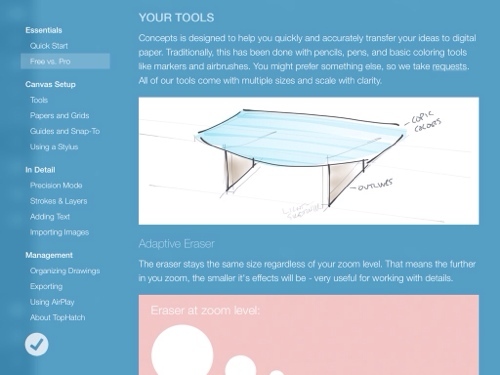 In the eraser panel, you can clear the entire page, or bit by bit. There are added eraser functions in the Pro version. As previously noted, there are ‘do’ and ‘undo’ buttons. The area with a lot of appeal is Precision mode (engaged by tapping the dotted arc icon). I was excited about the arc, angle, ellipse, and rectangular shape guides, which I thought could help me improve my drawing skills; unfortunately I was misled by the App Store screenshots. The arc tool is the only one in the free version. Using it is fun. When two fingers are faced on the screen, a dotted line appears and can be manipulated to make a straight line or arc of varying size. I created a straight-edged box by moving the line around and tracing the dots. It was great to get a perfectly straight edge. An arc is created by pinching the dotted line; after letting go, a perfect arc is made and ready for tracing. 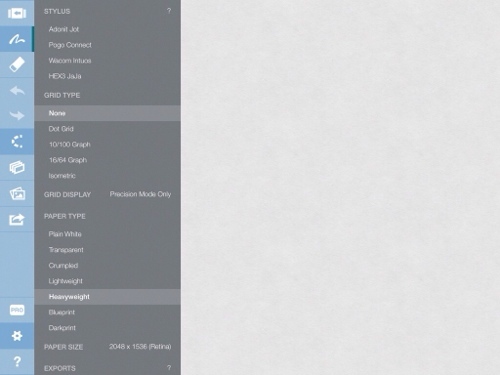 The paper size and weight are adjusted in the settings. The paper ‘heaviness’ includes transparent, blueprint, and plain white paper, among others. One of my favorite features is the grid display option. 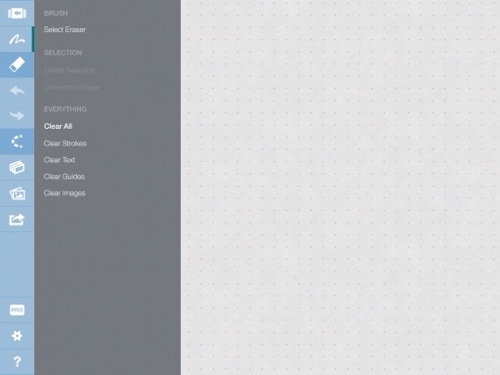 You can choose a dotted, isometric, and graph grids. I found the grid useful for making borders, and discovered that the grids can be made invisible whenever desired. Drawing are organized in a ‘gallery’, individually or in ‘stacks’. Drawings can be named and re-named. 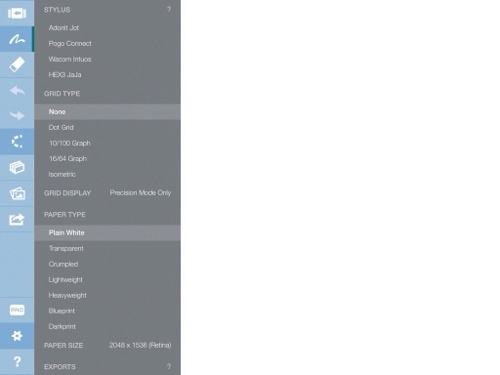 Images can be emailed, tweeted, among other options, and mirroring is enabled via AirPlay. ‘Unlocking’ features is done in the Pro Shop. Prices: High Definition and Vector Exports $1.99; Precision Toolkit and Shape Guides $1.99; Strokes, Layers, and Adjust $1.99; Images and Text $1.99. 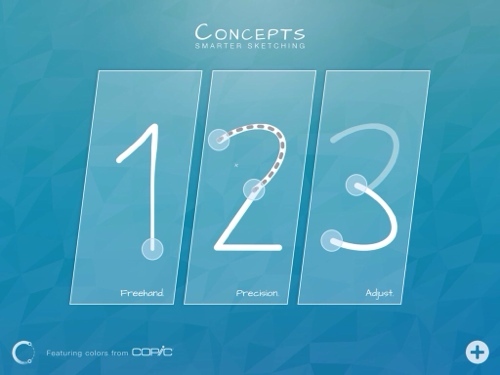 The free version of Concepts is excellent for freehand sketching, and is differentiated from other art apps by a more extensive color palette and the grid options. 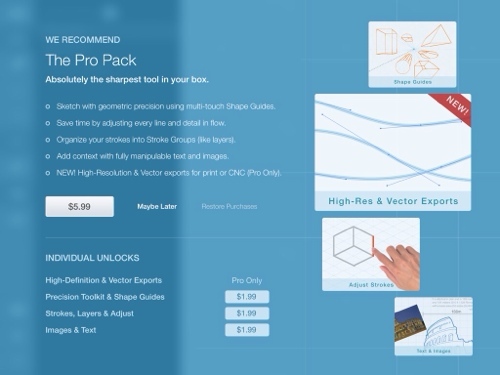 The more sophisticated design tools cost $5.99.